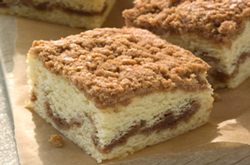 I have found three Starbucks Classic Coffee Cake recipes! You may find slight variations of the cake at different Starbucks locations. Sometimes there is a ribbon of cinnamon running through the middle of the cake, and sometimes the cake is dusted with a bit of powdered sugar. You’ll also find some versions with a few chopped pecans in the topping; and that’s the version here. This entry was posted in Articles & Reviews - podcasts, apps, websites, recipes, videos, photography, Articles and reviews about excellent recipes and tagged cinnamon crumb cake recipe, cinnamon streusel swirled within, coffee cake how-to video, coffee cake recipe, how to make coffee cake, how to make starbucks coffee cake, recipe for coffee cake, recipe for Starbucks' coffee cake, starbucks coffee cake, Starbucks coffee cake copycat, Starbucks Coffee Cake recipe, Starbucks coffee cake recipe how-to video, starbucks recipes.